ATV trail maps are now available for Android! Due to an agreement with US Trailmaps, Inc, these are now available as an in app or add-on purchase for BackCountry Navigator PRO. These are ideal for Android users who love exploring the outdoors using ATV’s or all terrain vehicles. ATV trail maps will help you safely explore new trails and areas. It provides information from and to your destination via interconnected routes. These maps are one of the innovations by U.S. Trailmaps, Inc. for Android. The vision of US Trailmaps is to deliver convenience and safety forpeople who love outdoor adventures by helping them research,locate and plan their ATV rides. US Trailmaps believes in quality and credibility and they found these qualities in BackCountry Navigator. One of the features that US Trailmaps envisioned for their service is real time navigation. BackCountry Navigator complements this. 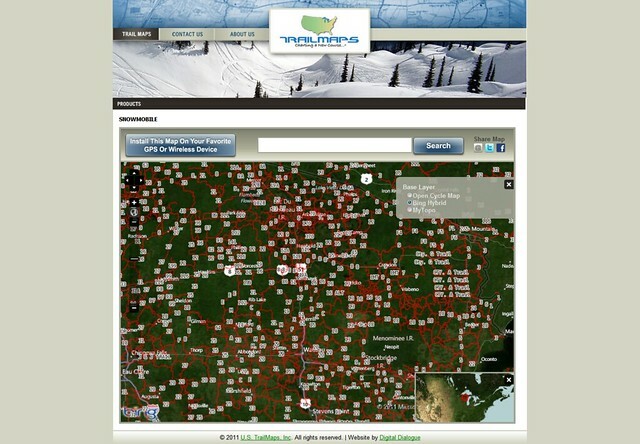 BackCountry Navigator can download and view mapsin areas without network coverage or function as offline navigator. The trails will show on the maps you've already previewed or downloaded. ATV Trail Maps for Android contains more than 25,000 miles of ATV routes and trails. 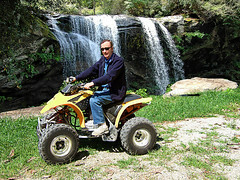 The trail maps include hundreds of points of interest relevant to ATV trail riding. Details such as the trail name or number are displayed when you select the item on the map. ATV Trail Maps for Android can be purchased from the Android market from within BackCountry Navigator PRO. You can find them by using the menu item "Purchasing Add-ons". Android maps are categorized into street maps, topo or topographic maps and aerial photography. The bases for choosing an Android GPS app are map types, map access, and styles of navigation. An Android phone can be used as a GPS device that is capable of providing navigation, mapping and tracking information anywhere on earth, as long as it can access data from the satellites. A street map is a map of a town or city, showing the positions and names of all the streets and roads for navigation. Most GPS receivers that are sold are packaged with a pre-programmed road maps and basic traffic information such as street names, speed limits allowed on a certain street or road, traffic condition and even parking lot locations. The compiled information contained in a street map will guide the user about his travel route, his current location and distance to his destination. Topographic maps or topo maps for short is a detailed and accurate graphic representation of cultural and physical features of the earth. Cartographers plot topo maps on large sheets of paper using a ratio scale wherein a single measurement of the map represents a bigger area of the earth. However, since the evolution of GPS, Android maps can now be downloaded and stored in an Android phone and with Backcountry Navigator GPS app, can be viewed online or offline. Topo maps are ideal for hiking and backpacking because it shows images and shapes of landscapes and terrains, including elevations of mountain peaks. A topo map is a broader and extended sketch of a street map. It can identify several cultural and natural ground features like water, vegetation and toponymy that street maps can’t. An aerial photograph is any photo captured above the ground. Aerial photographs are very useful. Aside from being originally used in military operations, it is considered as an important map substitute in the Global Positioning System technology. It provides people on earth an incomparable instrument to see images of the different parts of the world and know what is actually happening with its environment. Aerial photographs can be readily obtained and can be available as soon as it is taken unlike maps that take time to prepare. It can easily provide information about a monitored area like those hit by calamities and catastrophes. It aids in the evaluation of dangerous situations and helps in decision-making. Aerial photography can be relied on because it provides an on time view of the ground and exact changes from the time a map was made. Android maps and aerial photography are best used with Backcountry Navigator GPS app. The accurate information that it can provide gives direction in times when safety is needed. Capturing the movements of wild animals in its rare, natural and fluid state is a challenging task. It is an achievement, too. A trail camera is essential for hunters in tracking big animals like elks and deers. It is intended to capture images of these animals without disturbing their habitat. Areas usually frequented by these animals is determined and then a trail camera is placed on their track. The camera should be well hidden and scent free. Animals may not always detect a trail cam but they can identify a different scent that will disturb them, causing these animals to pass the other way. For many who love the outdoors, the possibilities of capturing a story in motion are infinite. Trail cameras are not only for elks and for deers; it is for anything about nature that brings joy. Follow your wish for a liberating and wonderful experience of the outback. Capture it with a trail cam and use BackCountry Navigator to guide your adventure. A line that separates the accumulated water flowing from mountain peaks to a continent is called a continental divide. In mountainous countries, a divide may stretch along mountain ridges and peaks. It is sometimes called a dividing range. The Great Divide or Continental Divide found in the North and South American continent separates the watersheds of the Pacific Ocean from the Atlantic Ocean. The CDT is one of the famous three long distance thru-hikes in the United States. It also has the most remote wilderness and the most spectacular mountain scenery. Commonly called one of the “Triple Crown Trails”, the other two are the Appalachian Trail and the Pacific Crest Trail. The Continental Divide Trail is a work-in-progress because many areas are still undefined. It will all depend on the hiker to find the correct route by choosing his navigation tools smartly. Professional hikers planning for a thru-hike should prepare themselves physically to endure the tough six months, 17 miles trek a day. Water is a precious commodity while hiking the Continental Divide Trail. Other parts of the trail run in boundless dry lands and mountains without means to fresh water. A hiker needs at least 2 to 3 liters of water a day to replenish fluid loss brought about by the strenuous, long hike. Next to water, extra battery for Android phone and solar charger is necessary. Cell phone signal in the Continental Divide Trail is nearly impossible because either the trails are too remote or the signals are blocked by the mountains. Nevertheless, Android GPS phones can still function as GPS even in areas without network coverage as long as maps are stored in the phone before the start of the trail. Some apps for Android GPS phones like BackCountry Navigator can download stored maps from the phone memory and view custom waypoints even without a cell phone signal. GPS is more accurate and convenient than a compass and map packs. Viewing a topo map offline using an Android GPS phone is possible. Topographic maps from U.S.G.S. are recommended as ideal because it shows the terrain detail. Upload a U.S.G.S. topo map in your phone before you hike and use BackCountry Navigator app to view it while on trail. Location is very important when hiking the CDT. BackCountry Navigator Android hiking app will not fail you in one of the most fulfilling hikes of your life. The Pacific Crest Trail is 2,650 miles of America's most precious treasure located in the Western United States. The origin of PCT started in the late 1930's when trail pioneers Clinton Clarke and Warren Rogers, after exploring the route, persuaded the US federal government to obtain a border-to-border passageway. It was called Pacific Crest Trail because it covers the high mountain peaks of California, Oregon and Washington. The scenic trail extends to three states ranging from Mexico to Canada. It uncovers the magnificent views of the desert, the vast glaciers of Sierra Nevada, the breathtaking views of volcanic peaks and the mountains of ice in the Cascade Range. From the diversity of snow-covered mountains, grassy fields to woodlands, the Pacific Crest Trail represents the Western United States' natural treasure – a wealth of nature to behold and protect. Countless hikers and horse riders prepare each year to embark in hiking and experience nature at its best at Pacific Crest Trail. Some travels a few miles only to see its beauty. However, most thru-hikers aim to complete the 2,650 trail miles. It takes thru-hikers 5 to 6 months to traverse the trail, which means they need to hike a minimum of 20 miles every day. • PCT crosses the three deepest lakes in the US: Lake Tahoe at 1,645 feet, Crater Lake at 1,932 feet and Lake Chelan at 1,149 feet. • Pacific Crest Trail has five different climate zones, each having exclusive earth's features, plant life and animal life. These territories are Washington, Oregon, Northern California, Central California and Southern California. • PCT traverses the San Andreas Fault three times, a rough distance of 810 miles through California. The world-famous trademark of the San Andreas Fault is the various rocks on both sides formed 28 million years ago. The Pacific Crest Trail is reasonably well marked for most of its area. However, it is still common for hikers to lose the trail because either it is covered by snow or they encounter an unmarked trail intersection. In these cases, GPS in Android phones is the most useful device to help hikers determine their exact location and direct them to the right trail. Thru-hikers have calculated that there is 70% network coverage on the Pacific Crest Trail. Lack of GPS signal is not an obstacle. The GPS capability of Android phones helps hikers to plot a course along the PCT. Because Android GPS phones can store and download waypoints even without network coverage, many hikers equip themselves with BackCountry Navigator app on their Android phones for their planned hikes. The GPS app makes their adventure much easier and safer. With Android GPS, finding a trail even if it's buried under the snow is simpler compared to the detailed process of a map and compass. Aside from convenience in knowing the exact location, Android GPS also provides the hiker a way to communicate with family and friends through trip sharing. GPS technology helps people find each other, support each other and share their adventures as it happens.